Montessori sensitive periods refer to a period of time when a child’s interests are focused on developing a particular skill or knowledge area. During what Maria Montessori describes as the child’s absorbent mind, birth to age 6, is when most sensitive periods occur. Some sensitive periods are so noticeable that even someone who doesn’t practice Montessori would agree with them. For instance, the Montessori sensitive period for walking is 12-15 months. Others may refer to some of these sensitive periods as developmental stages. Other sensitive periods take a bit more work on the adults part (preparing the environment and awareness). For instance, the sensitive period for order is often looked at as a tantrum or the “terrible 2’s”. When really, your child is simply going through their sensitive period for order and if given a properly prepared environment and routine they will flourish! When you know what your child is likely to be experiencing next, you can help them gain the most from their sensitive period. To support this sensitive period you will want to prepare your environment by allowing your child to crawl, pull up and encourage walking with or without assistance. Toys or materials that allow your child’s hands to hook, bat, touch, turn, insert and grasp small items are suggested. Repeating these activities will refine their skills such as movement of the and improve hand-eye coordination. At this stage, your child is improving their coordination of fine movements such as being able to hold small items with a pincer grip and release voluntarily. Gross motor coordination can be supported by walking, running, balancing and jumping. Again, repeating these activities will help to improve their coordination. To prepare your environment for this sensitive period you’ll need to speak to your child in clear language, read to them and allow them to speak their needs. No baby talk. Children become very sensitive to and interested in letter shapes and sounds. Activities such as tracing sandpaper letters with their fingers and correlating the sound of the letter with its shape are great in supporting this sensitive period. This sensitive period begins when the child learns the alphabet. Then they learn the sight words, which form the foundation for reading and writing skills. From the basis of writing your child can learn to read. Reading aloud to your child will help them improve their own reading skills. This sensitive period will be clear when the child is fixated on small objects and tiny details. This is an indicator that order and detail are coming together in the child’s mind. To properly prepare the environment you may want to get down to your child’s level and fix anything that needs to be fixed so the child won’t be distracted when doing work. When a child may see something in disorder this may affect their level of concentration. The sensitive period is characterized by the child’s fascination with sensorial experiences (taste, smell, sounds, weight, and touch). These experiences provide children with a system to classify objects within their environment. Provide your child with vast opportunities to explore and observe their environment using their senses. The sensitive period for order is a desire for consistency and repetition. An established routine, a carefully ordered environment, and established ground rules will help to keep your child from being disrupted by disorder. This is a need that needs to be fulfilled, having order helps a child in this sensitive period. Toilet learning is a natural process and should be done by following your child’s lead. Allowing children to become aware of their bodily functions allows for less distress when the child is older and more physically able to control their toileting abilities. This does not mean that your child should be completely toilet trained by this age. It simply means that around this age your child will probably show an interest in the toilet and will begin to have more physical control over her own bodily functions. Children experience a sensitive period for learning rhythm, pitch, melody, and more. Music develops the brain, leading to academic, social, and emotional growth. At this age, children learn that they are part of a group and develop an intense interest in social relationships. This is when children learn to develop friendships and participate in group play. This is a good time to introduce the importance of manners and basic principles of human interaction. Manner and courtesy are modeled by the adults. This means the parents should be using their manners with the children and other adults that may be around. Which of these Montessori sensitive periods has your child been in lately? Leave a comment below for some ideas of how to guide your child through their current sensitive period. “Montessori – All About Montessori Method of Education | Daily Montessori.” Montessori Education, www.dailymontessori.com/. 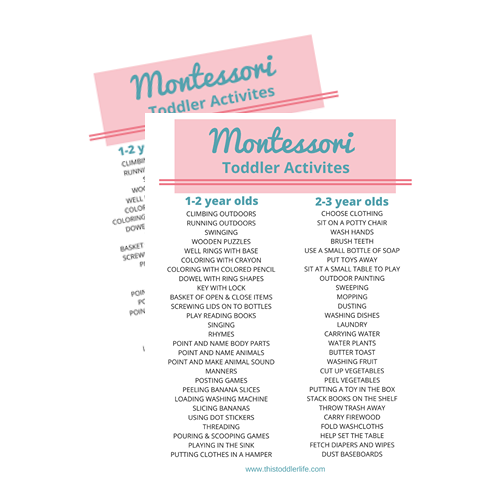 “Montessori Teacher Training and Parent Resources.” Montessori Teacher Training and Parent Resources, ageofmontessori.org/. By. “How to Recognise and Support Sensitive Periods in Your Child’s Development.” Montessori Academy, 9 Oct. 2016, montessoriacademy.com.au/how-to-recognise-and-support-sensitive-periods-in-your-childs-development/. Our 2 year old has picked up from school behaviours such as throwing objects when things don’t go his way, pushing others and rolling his eyes. Any tips to help him back on the right course? This still happens to my 3.5 year old and I think it’s a natural behavior for all people even adults! Check out https://www.allanarobinson.com/ She has some helpful scripts for dealing with behavior issues. 18 months is about the age my now 3-year-old started sleeping through the night but this didn’t happen on its own. I would suggest talking to a sleep expert who can help you find any sleep associations that have been created throughout your child’s life. Expressing emotions at this age is hard to do as they can’t communicate with words as easily as an older child. The best advice I was given about communication and emotions is to teach the child what calm looks like. So instead of saying “calm down” in times when your child appears panicked, it’s better to take a moment when things are calm and say “this is calm”. First defining what calm looks like then asking them to “calm down”. Additionally, you may want to consult a doctor if you are worried about your child having panic attacks. My daughter is almost 15 months and can get very frustrated if things don’t go her way. She can ‘storm’ off shouting and hit things in temper. Sometimes she will randomly want to hit me. We are calm parents and let her explore her environment freely and safely. But I really don’t know where this temper has come from and how do I help her manage it? I mainly ignore negative behaviour and reward the positive but she is continuing to have these outbursts. Is there anything else I can do? Is it just a phase? At 15 months she is probably having trouble expressing herself. Communication skills are developing but it can still be hard to relate her feelings or emotions to you without knowing the words. Frustration and hitting are often a sign of a material being to difficult. If she is expressing these frustrations while using a certain toy or material you may be able to avoid the situation by giving her the step down from that material. For instance, if she is frustrated with a 6 piece puzzle you could try a 1 or 2 piece puzzle then work your way up. Other than that I would try to put words to emotions like “I am happy right now. This is what it feels like when we are calm” etc. This way when you ask her if she is happy, sad etc she will be able to know what you are talking about. My 9 month girl is is on the verge of walking on her own and is starting to get fussy if she doesn’t get her way. How does this correlate to montessori sensitive periods? What would you suggest? Do you have an area for movement set up for her? Perhaps with a pull up bar for her to independently pull up on? It sounds as if she is going to really love Montessori as she grows older because it promotes and supports a child’s independence. Please suggest activities for 10 months old boy. Is your 10 month old walking? Have you been able to try a pull up bar at home? Holly is an education consultant for modern-day parents, using step by step guides to bring Montessori into more homes. When Holly isn’t helping other parents she’s spending time with her family. Their love of nature and travel takes them on many adventures around the world.